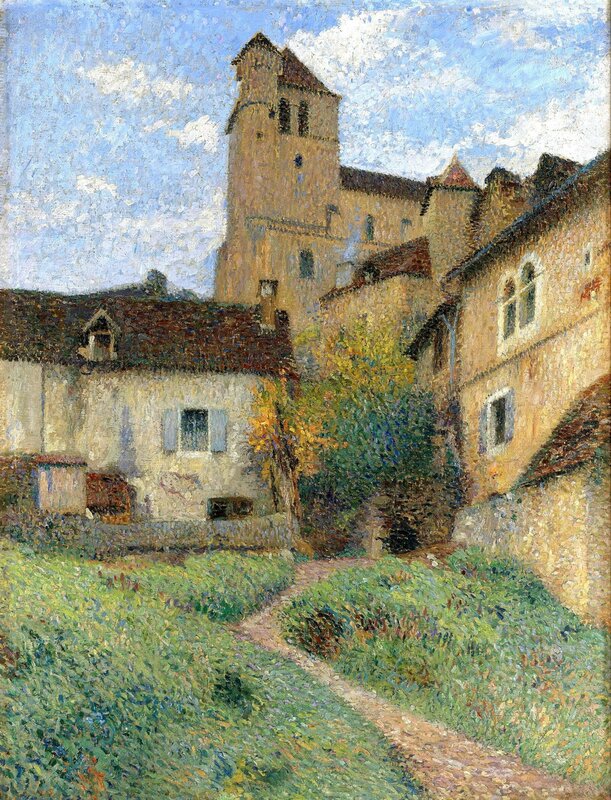 This beautiful painting depicts the church in the village of Saint-Cirq-Lapopie from the bottom of the hill. Dedicated to Saint Cyr (the vilage is named after him) and to Saint Julitte, his mother, it is a Gothic building founded in 1522. It retains its medieval gold leaf decoration from the 12th Century and its 13th Century murals. Henri Martin was so enamoured by the village of Saint-Cirq-Lapopie, enchanted by its charm and beauty, that he bought a house there in 1912. It is marked predominantly by late Medieval and Renaissance buildings and Martin was obsessed in capturing every last detail, from the timbering of the houses to the whiteness of the brickwork. Here, Martin has taken care to render every last detail of the elegant buildings such as the half- timbered roofs. He painted the area constantly throughout his long career, attempting through use of high or low angle viewpoints, pyramidal compositions and tight structure to capture the essence of the town.